At Search Scientists, we pride ourselves on being lifelong learners, and that pays large dividends in PPC. Constant algorithm changes, rule additions, new competition, and more can quickly change the landscape we work in. It is not enough to simply optimize and tweak anymore. We must do thorough PPC planning and implement those strategies in order to thrive. And that’s exactly what you get at Search Scientists. Starting a new journey in PPC with your business is an exciting time. You can expect immediate money-saving techniques in previously existing accounts or a plethora of information emails regarding what will happen with your brand new account in the coming weeks. But what about when the dust has settled, tracking codes are installed, and the campaigns are set up? We optimize and tweak, for sure, but what about long-term growth? This is where Search Scientists executes quarterly PPC planning, goal setting, and strategic vision mapping. Once per quarter, we meet with you to discuss how we believe we can push everything forward — beat the previous quarter’s data, expand your business onto a new platform, or how the ever-expanding world of PPC can be used to your advantage. We keep data records as time passes, so we can easily see a birds-eye view of what worked, what didn’t, and how we can improve, quarter after quarter. Check our PPC Hall of Fame out for some of our awesome records. Another oft-overlooked area that can help make or break your PPC efforts is your website. Landing pages, in particular, can be powerful tools to help turn a qualified visitor into a customer. Each quarter we’ll review your landing page(s) and offer ideas on a new page to test against the current landing pages and anything we believe may help, based on PPC best practices. When it comes to customers, we can agree that not one is just like the other. Many shoppers are still in the learning and comparing phase while others come ready to pull the trigger. We’ll work with you to diagnose your sales funnel, present you with ideas to test variants of your website sales funnel against the existing funnel, and help turn more visitors into paying customers. Chances are you aren’t the only business in your respective niche. Competition can make it difficult to find any ad real estate on SERPs or Facebook News Feeds. 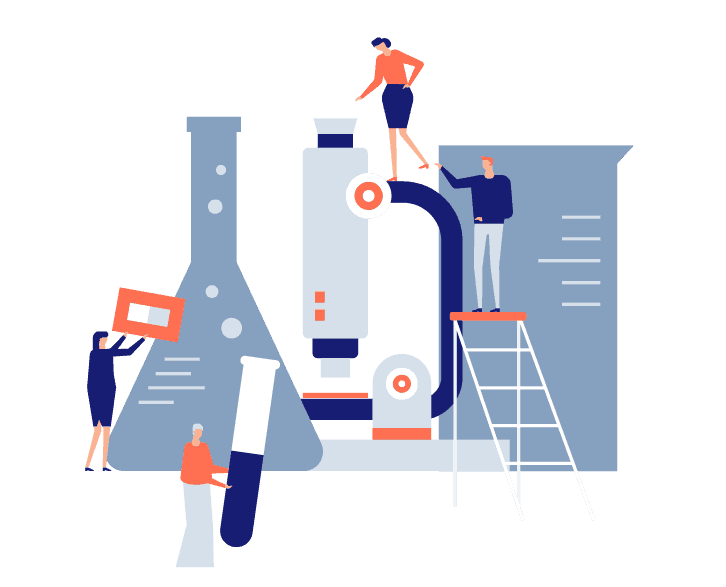 Search Scientists are keenly aware of this and make sure to routinely check in on what the competition is doing, if they’re outbidding us on keywords, and more. This helps us get out in front of the competition and gives us a distinct edge in the market. Across platforms like Google Ads, Facebook, Instagram, and more, it’s been proven that high-quality quality images with a message and call to action are more effective than a generic, boring, or cluttered image. We’ll work with you to create and split test images on all platforms. Search Scientists doesn’t want you to only see short-term improvements. We want to help you grow and expand in the long-term as well. Enjoy our in-depth, quarterly goal setting sessions and strategic vision mapping and watch your account grow like it hasn’t before. A quarterly goal setting and vision mapping session is very important to keep up with changes to things like algorithims and new rules or regulations (because they can affect your business overnight). In our Free PPC Audit we'll take a deep dive into your account and give you feedback on things you can do to see even better results. I was initially attracted to the world of PPC due to its capabilities to make a direct and immediate impact on growing businesses. Finding just one sweet spot keyword can result in a positive return in no time flat. It’s a good feeling to be able to sit back at the end of the day and know you’ve helped not only yourself but others as well.